Jayson and I decided that it was too nice out to not go for a ride, so we agreed to meet at the corner of Gotfredson and N. Territorial roads about 6:15. Aaron's had a stiff, painful neck muscle all day and chose to forgo joining us. 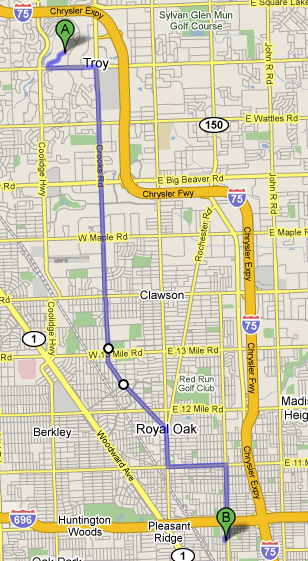 We continued up Gotfredson, took Brookville west to Curtis north, then veered off on Angle/7 Mile Rd. and followed it all the way up to E Shore Dr. We followed that along the east shore of Whitmore Lake. It's a beautiful area with a lot of nice houses surrounding the lake, and the setting sun had all the trees glowing orange and yellow. From there we went up and around the north shore of Green Oak Lake, which was almost as nice at Whitmore, I think, but the fading light made sightseeing difficult. I was also discovering that the combination of my dirty visor and the "starburst" effect around light sources caused by my RK procedure was screwing up my night vision somewhat, so I had to focus on Jayson's taillight. After rounding the lake we headed into South Lyon in search of food, and ate at Crossroads Grille & Bar. I had a great bar burger, and the cute, flirty waitress brought us a couple slices each of pumpkin bread and banana nut bread that they bake there. She told us she loved motorcycles and used to ride pillion with her ex-boyfriend, but could never ride one herself because she "couldn't work the gears". She also told us about the time she burned her leg on the exhaust because she was wearing a skirt and sandals. I was proud of myself for not shaking my head, or rolling my eyes, or telling her we saw videos about people like her in our Motorcycle Safety Foundation training course. Besides, she was too nice to berate, and the pumpkin bread too tasty. After completely negating the benefits of the 4-mile run I'd had before riding, Jayson and I parted ways and headed home. The return was uneventful, though I expected a deer to jump out in front of me at any moment, and I did pass a few recent carcasses on US 23 south. When I exited at Maple Rd and started to enter the first roundabout, it suddenly felt like something soft and fluttery hit the back of my left calf. Thinking it might be a bird or bat I brushed at it, but there was nothing there. It was only after I'd gone through the roundabout and was coming to a stop at Miller Rd that I realized what I'd felt was my calf spasming. I'd done a hard calf workout yesterday, gotten a massive cramp last night that woke me out of a dead sleep, then ran four miles this afternoon before riding nearly 60 miles in a semi-crouched position, and my leg had had enough. The bike vibration, tight boots, and my focus on the road masked most of the pain, but it was bad enough that I had trouble shifting until I reached the corner of Dexter, where it relented. I'll definitely be eating a banana and doing a lot of stretching before bed tonight. 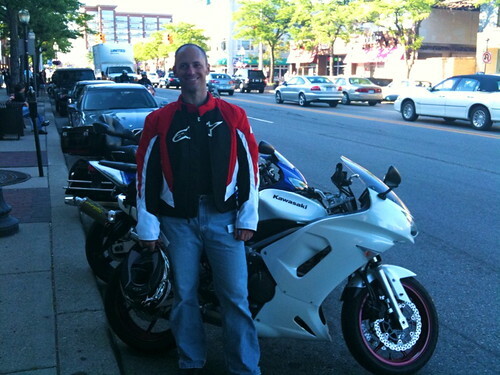 I'd love to go riding again tomorrow, because the high is supposed to be 66º, but it's also supposed to rain, so we'll see. 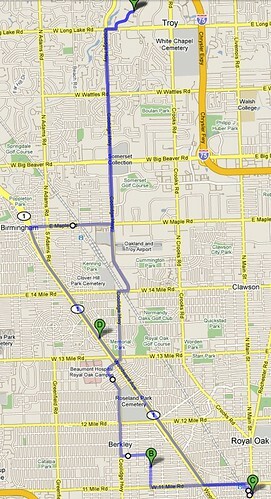 22 miles round trip to see and Eric, including my first after-dark ride. The red LEDs behind the body panels look VERY cool at night. 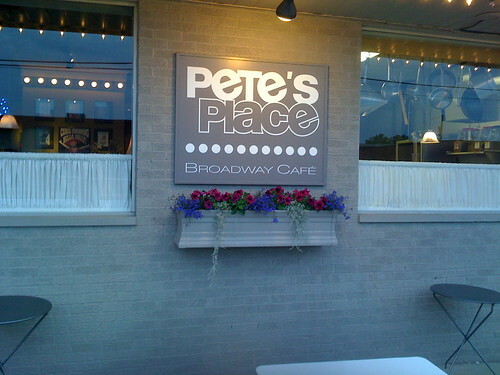 While I was there we walked up to Pete’s Place, a former coney diner converted to a higher-end cafe. 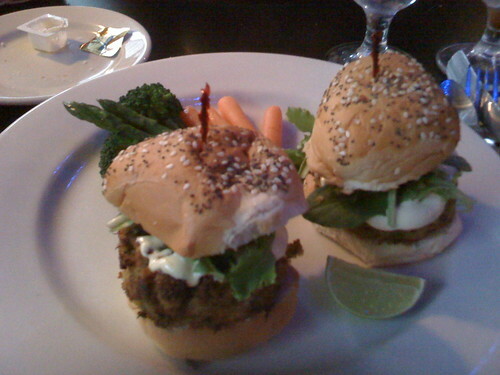 The crabcake sliders with lime-wasabi aioli were teh yum.